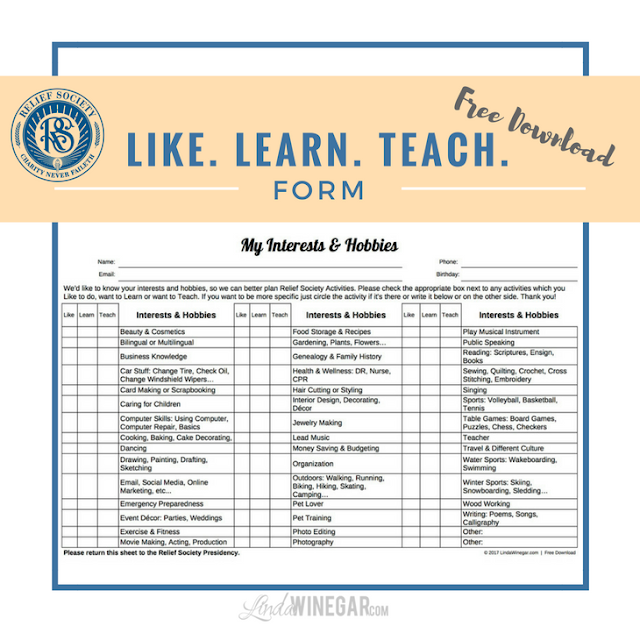 Like.Learn.Teach PDF Form to get to know the interests and hobbies of your Relief Society sisters. 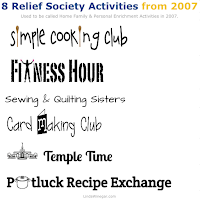 In 2007, I got to serve as our Relief Society Home Family & Personal Enrichment Coordinator, now it's just called Relief Society Activities. It was one of my favorite callings! OK honestly...all of my callings end up being "one of my favorite callings" because I finally end up liking the calling, and then get released. LOL The Lord knows me and that's how it works, for me anyways. As the HFPE Coordinator I needed to find out what my sisters were interested in and where the talents were, because for realz if you were interested in baking and cooking there was NO WAY that I was going to be able to teach you anything, because I barely even know how to follow a recipe and keep it from burning in the end anyways. True story! 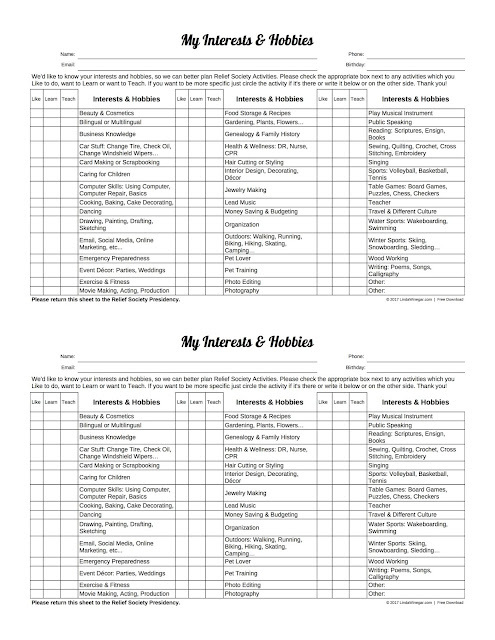 So, I made up this form in MS Excel at the time and sent it out to the sisters to fill out and bring back to me about what they LIKED, wanted to LEARN and maybe could TEACH! What came after the results were tallied, was pure inspiration. With a lot of help and other sisters stepping up to teach and be "in-charge" we had 8 classes going on weekly/monthly/quarterly that sisters could attend based on their personal interests and availability, and I even designed a website for it to keep the pics and recipes and info on. Sadly, I don't have the site anymore, or I'd show you the awesome recipes and things we did. Click here to view the list and even a sample calendar of what we did. This experience has taught me these 5 things. The Lord wants to help us with our callings. Heavenly Father answered my friend's prayer of help with her own calling, & reminded her to ask someone else with other talents than her own to bless her. I KNOW the Lord appreciates our efforts in our callings, even if it's just to preserve a super old spreadsheet typed up 10 years ago for a calling I had long forgotten about. The Lord knows when you need a boost, when you need to feel loved, He's there and He knows how to love you the way you need to be loved. How did He know I would need motivation and love today? There's someone else, besides my sweet friend Patty, out there who needs this form for their Relief Society calling. I'm grateful the Lord looks for ways to love me the way I need to be loved. It's the higher law, it's the "Platinum Rule" my hubby reminded me of just yesterday. There's the Golden Rule which is "treat others as you'd want to be treated" and then there's "treat others as the Savior would treat them" and also that's how we need to be treated. Being blessed to find this file isn't going to make others as happy as it has made me this week! And if you need this file and are going to use it, please know the Lord loves YOU enough too because He made it possible for me to share with YOU!